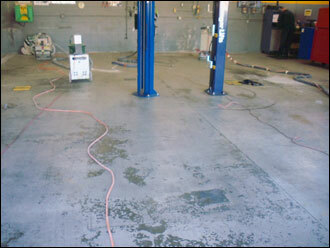 A busy automobile repair shop requested to have a new “White Night Grey” SpartaFlex solid color coating installed in their concrete finished repair area but needed the work completed quickly due to their heavy workload. Epoxy was not an option because of its long cure times. 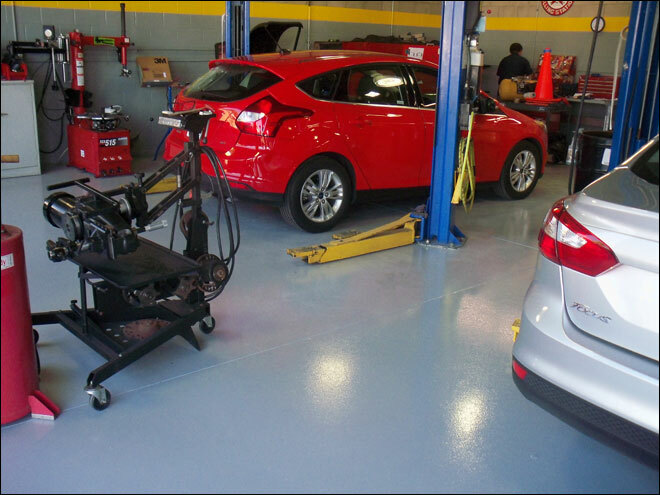 We knew SpartaFlex would be a perfect solution for them because it cures quickly and is resistant to chemicals found in the automobile shop environment. The dealership closed early on Friday and they moved all of their equipment out. We treated the concrete with fast acting oil-removing emulsifiers and ground the concrete surface using a combination of 4”, 7” and 18” dustless diamond grinders in progressively finer grit levels creating a smoother and less imperfect finish on the concrete. We applied 2 coats of SpartaFlex Grey and 2 coats of SpartaFlex PUR 100% Solids Gloss Finish creating a 25 final mil thick coating. The work began on a Friday evening and was completed by that Sunday evening so work time was lost by the dealership. They opened for business on Monday morning without disruption and without concern about driving on the newly coated surface due to SpartaFlex’s fast curing properties. A newly constructed Middle School wanted a durable, slip resistant and LEED compliant zero-VOC coating on their concrete gymnasium floor. Epoxy was not an option due to its inability to meet the LEED standards and the long cure times associated with epoxy wouldn’t meet their tight schedule. We suggested they SpartaFlex due to its fast cure times, zero-VOC composition (meeting all LEED requirements), superior wear qualities and slip resistance (even when wet). We prepared the concrete surface using a combination of 4”, 7” and 18” dustless diamond grinders in progressively finer grit levels creating a smoother and less imperfect finish on the concrete. We applied multiple coats of SpartaFlex in the colors that were specified by the architect as well as creating the basketball and volleyball court lines. 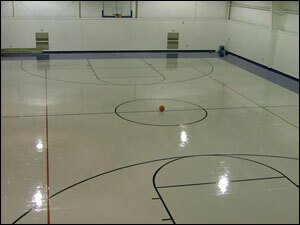 We applied 2 coats of SpartaFlex PUR 100% Solids to give the gym a durable gloss finish. The work was completed on schedule, met their budget and the manufacturer supplied them with a certified letter that confirmed the zero-VOC chemical composition of SpartaFlex. 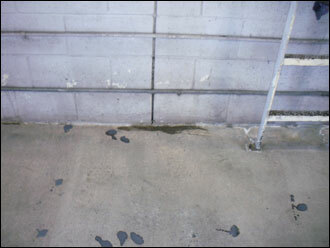 A distribution company owned a large 10,000 sqft warehouse and wanted a clear sealer to install on their warehouse concrete floor area that would provide them with a durable, long-lasting finish that would resist permanent stains from fork lifts. Other coatings were not an option because the company wanted a coating that would last 10-20 years or more. We suggested SpartaFlex due to its superior wear qualities and its long lasting finish would allow any ‘skid” marks from the fork lifts to be steam cleaned off from time to time. 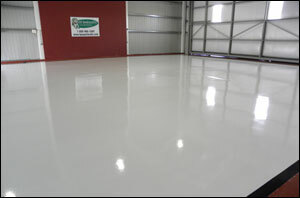 We prepared the surface using our dustless grinding system and applied 2 coats of SpartaFlex 100% Solids PUR Clear Finish. The work was completed in sections, on schedule and within budget. 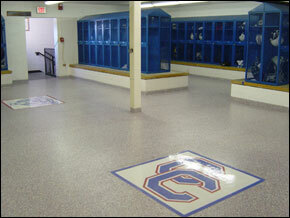 A school wanted to recoat their locker rooms and bathrooms. They had used quarry tile in the past and were tired of spending money on a regular basis to clean and maintain the grout. The tile did not make the facilities appealing. We knew SpartaFlex would be a perfect fit. We also were able to mix and match chip colors offered by the chip manufacturer to match the school colors. 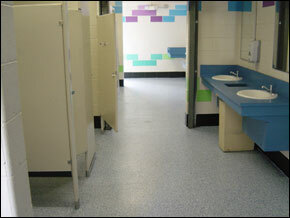 After another contractor removed the tile, we were able to install 3 coats of SpartaFlex over the course of a weekend. We also were able to install a “coved” base along the base of the wall where it met the slab to allow easy cleaning. Because of SpartaFlex’s superior durability and resistance to the development of bacteria, the re-coated school facilities are easier and cheaper to maintain than the old facilities. The kids also love the the fact that these facilities inspire their school spirit because the school’s colors are so proudly displayed (by the way, we can install school logo’s in our floor coatings as well!). A prestigious southern California university constructed a new commercial kitchen and needed a kitchen floor installed to meet new construction codes. They had an aggressive construction schedule and were unable to allow more than a few days to complete the project. We installed the ¼” floor including a 6” integral cove finish in just 4 days using SpartaFlex and SpectraQuartz “Forest Green” quartz products. 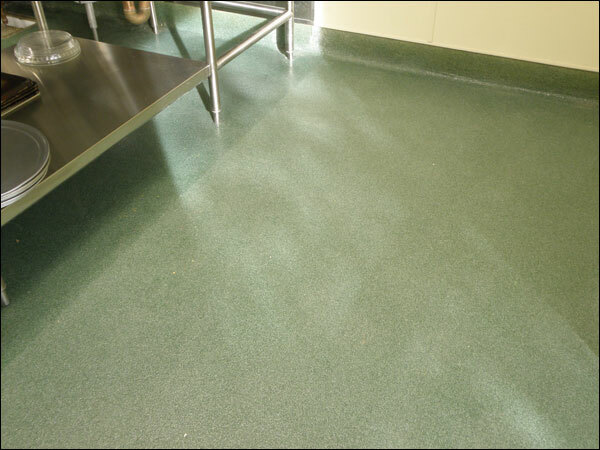 The floor features non-slip walking areas and smoother, easy to clean sections of the floor beneath the kitchen equipment. Contact us today and tell us your story. We are confident that we can meet your schedule, budget and finish requirements!